Those going to see Steven Spielberg’s “Bridge of Spies” last weekend might have thought, based on the trailers, that they were getting a white-knuckle thriller in the vein of “Argo.” All the scenes of men drinking scotch and negotiating were left on the cutting room floor. 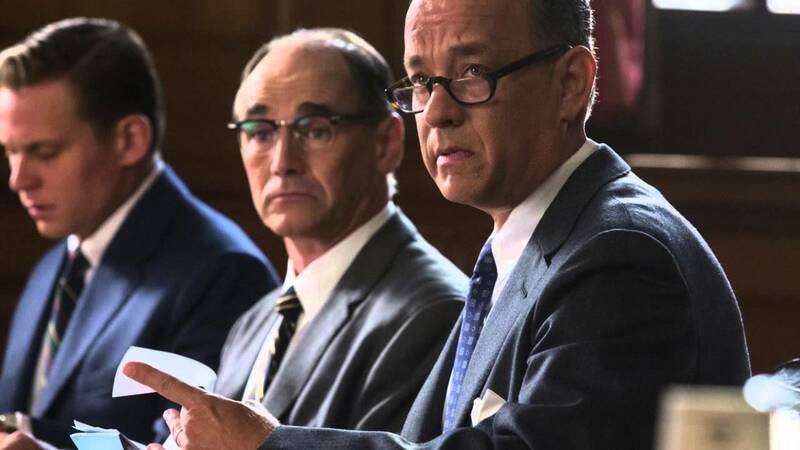 But hopefully audiences were able to adjust expectations, slow down their heart rates a little, and appreciate “Bridge of Spies” for the top-notch and engrossing film that it is. Featuring a director, actors (Tom Hanks and Mark Rylance) and screenwriters (playwright Marc Charmin and, on rewrite, Joel & Ethan Coen) working at the top of their game, “Bridge” is immensely enjoyable and something of a companion piece to Spielberg’s last film, “Lincoln.” Both are historical dramas about men doing the right thing against immense obstacles, both because it’s the right thing to do, and because it’s the smart thing to do. Spielberg’s touch asserts itself in a witty opening shot, in which Russian spy Rudolph Abel (Rylance) is using a mirror to paint his self-portrait, likely an allusion to Norman Rockwell’s “Triple Self-Portrait.” Rockwell was the quintessential American, and so it seems is the quiet, normal Abel, who moves through 1957 Brooklyn with his ill-fitting coat and paintbox. But, of course, he’s also a Russian spy. Spielberg reasserts this with his bravura ten-minute opening sequence, devoid of dialogue or music, in which Abel, shadowed by FBI agents, goes about his day — taking the subway, painting a landscape, and, oh, picking up a secret message in a hollow coin taped to the underside of a park bench. In its evocation of the authentic sights and sounds of 1950s New York, this opening could be a spy sequence as envisioned by “On the Bowery” filmmaker Lionel Rogosin. From this wordless sequence, we go right into a sequence full of words, as we see insurance lawyer Jim Donovan (Tom Hanks) negotiate a case. In one exchange, he shows himself to be canny, direct, and above all absolutely sure of what constitutes fair and unfair. I didn’t realize until the closing credits that Joel & Ethan Coen had done a rewrite on the screenplay, but of course their fingerprints are all over this scene in its use of quick, juicy dialogue to establish character. Donovan is tasked with defending Abel in court, and the first half of “Bridge of Spies” is rather familiar one-man-against-the-system courthouse drama (not unlike Spielberg’s own “Amistad”). When even the judge is openly siding against you, you know you’ve got a losing case, and Donovan becomes a pariah for not just defending Abel, but defending him to the best of his abilities. Two things stand out of this first half of the film for me. The first is how important the relationship between Donovan and his client Abel are. Donovan is no bleeding-heart, and recognizes Abel as a foe of his country. But he also respects the man as a fellow good soldier who plays by the rules rather than taking the easy way out. These are both practical, honorable men. It helps that Rylance turns in such a sly and winning performance, with Abel concealing a dry wit underneath that hangdog face. The second thing is how Donovan plays the case. In front of the Supreme Court, Donovan talks in flowery terms about America and the need for America to put its best foot forward, to play by the rule book, as an example to the rest of the world. He believes this. But in private, especially when he’s arguing sentencing with the judge, Donovan brings forth more practical arguments. Keep Abel alive, and he’ll be good insurance in case an American spy is ever caught by the Soviets. Treat Abel well, and our future captured spy might be treated as well in return. This is where “Bridge of Spies” has its strongest linkage to “Lincoln,” which focused on President Lincoln’s political efforts to get the 13th amendment abolishing slavery passed into law. It’s the right thing to do for the country, but it’s also the smart thing to do for a divided country. “Lincoln” is less about big speeches and more about the hard work of politics, of calling in favors and twisting arms and using your power strategically to achieve a desired outcome. And that’s what the second half of “Bridge of Spies” is all about, set in 1960, as Donovan goes to East Berlin to negotiate the exchange of Abel for U2 pilot Gary Powers and American grad student Frederick Pryor. 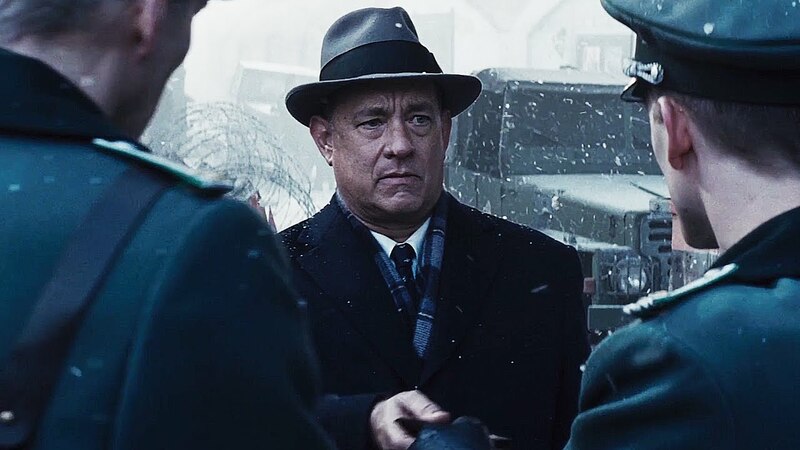 The first half of “Bridge of Spies” has beautifully set up the second. The scenes of Donovan sipping Scotch with Russian and East German officials (each with competing agendas) may not making for thrilling spy cinema. But, just like in “Lincoln,” it does become thrilling to watch Donovan use his powers of negotiations, of understand when to bend and when to stand firm to achieve a desired outcome. Rylance’s droll presence is missed in this second half, although the screenplay (presumably the Coens) includes some funny touches, such as the fact that these Cold Warriors all have actual colds. (When the cynical CIA agent catches Donovan’s cold, it’s a nifty metaphor for how he’s coming around to Donovan’s way of seeing the world.) And that last scene on the bridge, a pre-dawn stalemate, is suspenseful because the film has laid the groundwork for how shaky this agreement is, how it’s built on human relationships that could go wrong at any time. Many critics have drawn connections between “Bridge of Spies” and contemporary American politics, whether it be Guantanamo Bay or drone strikes, and whether they reflect American values. I think that’s accurate, but the film is making an even broader point about the way America engages the world. The Cold War was often described as a chess game between superpowers, and “Bridge” would like to see us get back to that mindset, to start thinking two or three moves ahead, to foresee what consequences might arise from what we do, instead of reacting rashly. To do the right thing, because it’s also often the smart thing. To keep talking to our enemies. And to carry some insurance.